Cloudy with showers. Thunder possible. High 51F. Winds NNW at 10 to 20 mph. Chance of rain 70%.. The United States' Shelby Houlihan, left, and Molly Huddle race in the final of the Women's 5,000 meters during the World Athletics Championships in London. DES MOINES – Shelby Houlihan is on an impressive streak. The former Sioux City East state track champion has won the past five USA Track & Field Championship events she has run between the indoor and outdoor seasons. The Rio de Janeiro Olympian will look to stretch impressive accomplishment to seven this weekend at the USA Outdoor Track & Field Championships at Drake Stadium in Des Moines. Houlihan began her run of success by winning the one- and two-mile races at the 2017 indoor championships and followed that up with a victory in the 5,000 meters, her Olympic event, at the 2017 outdoor. Earlier this season Houlihan captured the 1,500 and 3,000 titles during the indoor season. She will look to defend her 5,000 title Sunday after running the 1,500 prelims and finals beginning Thursday. “I don’t know how important it is to (Bowerman Track Club coach) Jerry (Schumacher) since he is having me double, but it is pretty important to me,” Houlihan said. “I have a little chip on my shoulder. I have been able to win the past five national titles that I have run and I am kind of on a streak right now and I really want to keep that going. The runner that still sports the @Shelbo800 Twitter handle credits her emphasis on training for the 5,000 for making her better in all her distances. Houlihan will enter Drake Stadium having recently posted one of the most impressive victories of her career, beating a strong field to the line to win the 1,500 at the Prefontaine Classic in Oregon in May. Houlihan ran a four-second personal best of 3:59.06 to post the best time in the world this year in the event. The Sioux City native rallied from ninth place at the start of the final lap to record the win to become just the fourth American women to win a Diamond League 1,500 title. She has proven to have one of the best finishing kicks among distance runners in the world and others may be starting to take notice. 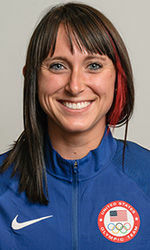 The former Arizona State national champion in the 1,500 has adjusted her style of running since her college days. Having already run at the world level Houlihan knows it is a good strategy because no runner is pulling away from the best in every race they run. Houlihan was sidelined for a couple of weeks last December because of stress reaction in her leg. She returned to training on Jan. 1 back at altitude in Mammoth Lakes, California. The altitude training is not something Houlihan did prior to turning professional and wasn’t sold on the idea to start. “I was a little skeptical coming up here but Jerry knows what he is doing, and he has had his athletes, even prior to me joining, go up to altitude and do altitude training,” Houlihan said. “It had obviously worked for them so I just kind of bought into that and came up here and kept an open mind about it. It has been working out really well and I feel like it has been able to push me to that next level of fitness every time I come up here. Her results certainly support that belief, but being part of the club has benefited Houlihan far more than just the altitude training. She credits the other members of Bowerman for helping push her during workouts and improve her diet. “This is really the first group of training partners I have had,” Houlihan said. “I kind of trained mostly by myself in high school, and in college I had a team but I mostly did workouts by myself or at a different pace. I definitely feel we have a really strong bond among our group that maybe other people don’t because we have so many different people that have so many different strengths. If Houlihan needs any more support or encouragement she will likely receive plenty at a stadium where the daughter of Bob and Connie Houlihan was an eight-time Drake Relays high school champion and an eight-time state champion. BIRMINGHAM, England -- Shelby Houlihan finished fourth in the women's 1,500-meter run at the IAAF World Indoor Championships here Saturday evening.